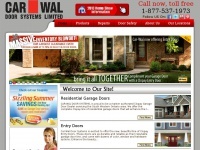 For over 40 years, Car-Wal Garage Doors provide the best garage doors & openers service in Western Ontario. Contact us today to get a free quote! three profiles were found for Carwal.ca in social networks. Among other social networks the website is represented in Facebook, GooglePlus and Pinterest. The web server used by Carwal.ca is run by Telus Communications and located in Canada. 16 other websites are located on this web server. Most of them are provided in the english language. The websites of Carwal.ca are hosted by a Microsoft-IIS server and were developed in the programming language ASP.NET. The content management system DotNetNuke is used. The markup language of the website is XHTML 1.0 Transitional. The website does not specify details about the inclusion of its content in search engines. For this reason the content will be included by search engines. The homepage of the website is "/ca/".